A beautiful day that I will always remember – today. Between the ages of sixteen and twenty-one, I wrote at least thirty songs. When I remember the musical years of my youth, I have clear and intense sensations of joy. I know that it is hard for me to admit that for the last thirty years I did not experience that kind of joy. I assumed it was in the past and “over” for me. I was such a different person when I devoted myself to being an artist and raising my children. I experienced many other emotions; perhaps “satisfaction” is descriptive of how I felt about my career. I certainly felt immense love for my family. It has been difficult for them to adjust to my “new personality.” Now I spend a lot more time indulging my passions and not taking care of them. For such a long time, I was very good at taking care of a lot of people! Today, the new person that I am had an adventure. I am pleased to share that I had a joyful memory that reminded me of my youth. I felt like I was twenty years old again! At dinner tonight, my husband and family regaled in hearing me describe today’s adventure. 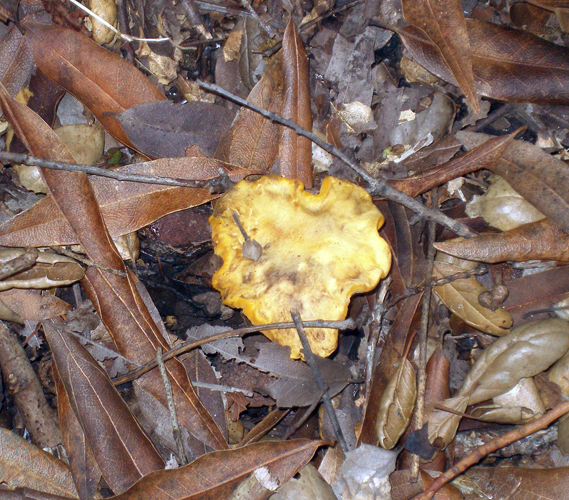 I am proud to say I went on a “mushroom hunting expedition,” and I am still alive after eating those delicious chanterelles! With the writing of my blog, “My Journey’s Insight” I have rediscovered many wonderful friendships. My college friend, Carol (#200), and my childhood friend, Joni (#213) met me this morning at my mother’s nursing facility to embark on our adventure. 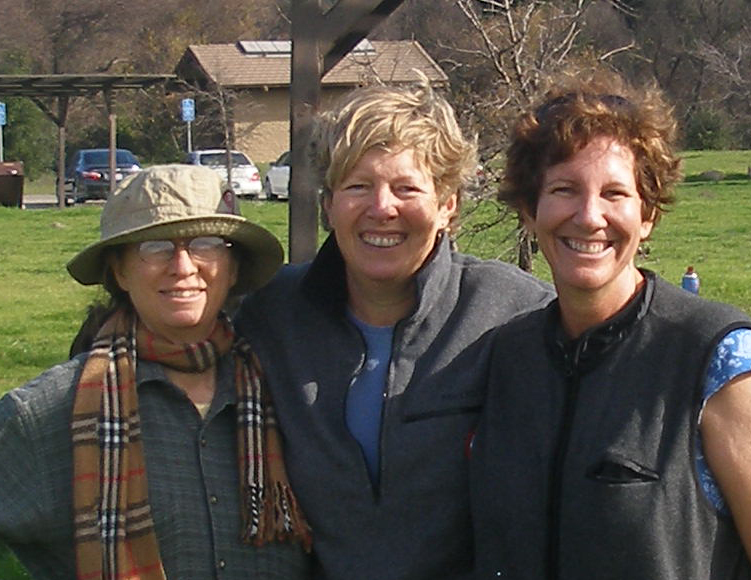 Judy, Joni and Carol before embarking on our adventure. 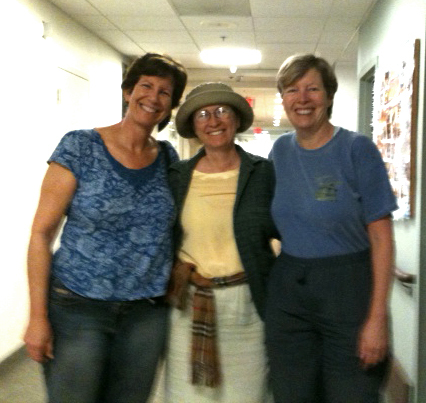 Before we left, it was interesting for my mother to see my two good friends – especially Carol after so many years. 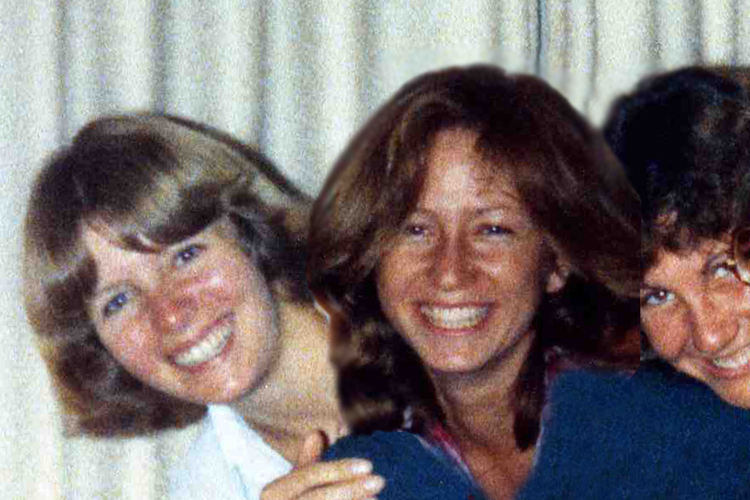 Both Carol and Joni had joined me separately on family vacations, and we had a lot of wonderful memories.My mother had excellent long-term memory this morning. She remembered that Carol had dated my ex-boyfriend Sam! 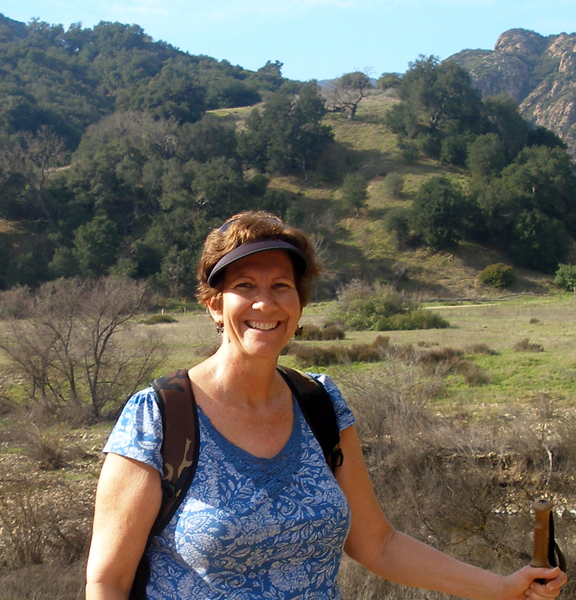 When Carol first suggested hiking to me, I was enthused. When I am outdoors I am always mesmerized by the colors and textures that surround me. I love the aromas also and that alone can trigger wonderful memories for me from childhood. 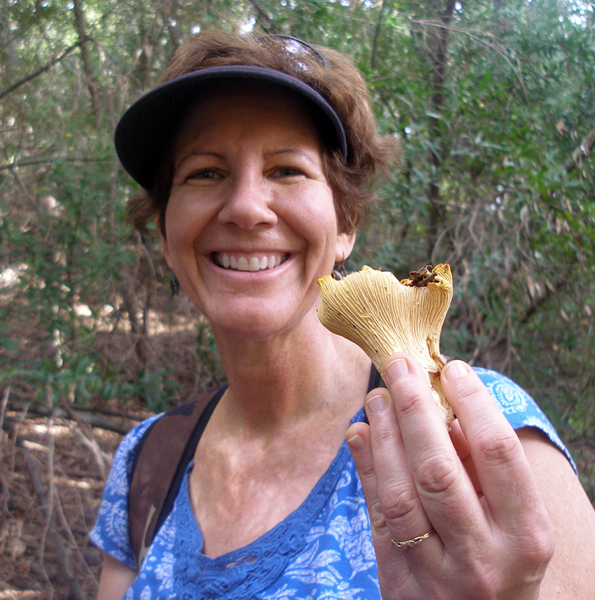 When Carol mentioned I could join her on a hike collecting Chanterelle mushrooms, I wasn’t sure if I was courageous enough to eat them. 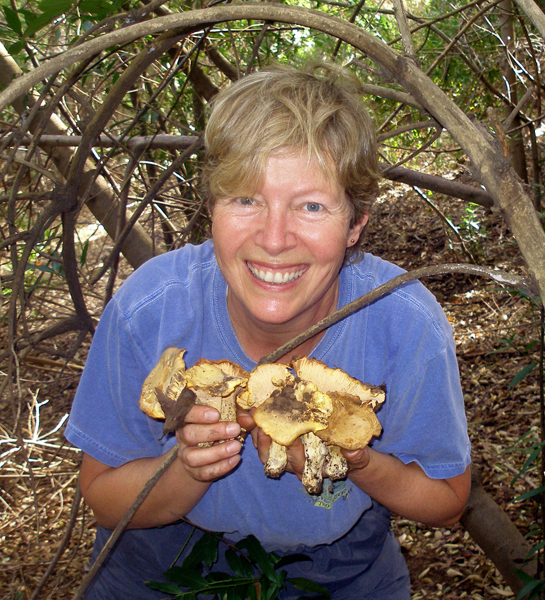 However, Carol was an experienced forager with a lot of knowledge; she had survived her previous exploits. I was tempted! My childhood friend, Joni, probably had not seen Carol since one of my birthday parties in 1980. I put all three of us into a picture below. Carol, Joni, & Judy in 1980. 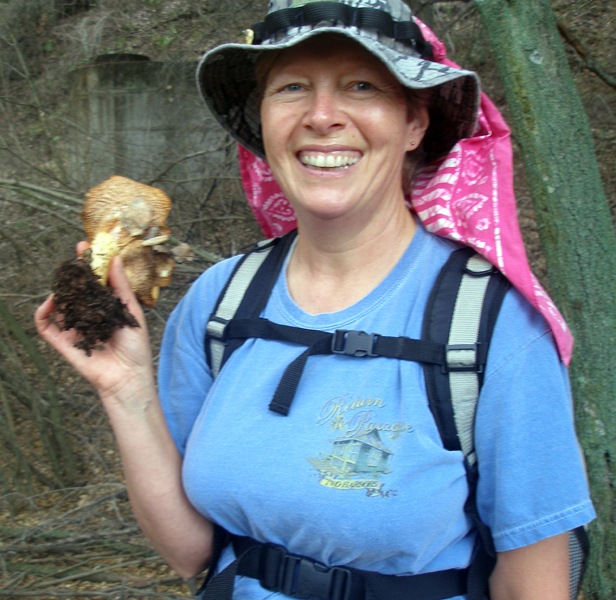 Joni knew about my outing and mentioned to me that she loved mushrooms. It was lovely that Carol was open to including her. Thirty years are a long time between girlfriend exploits. 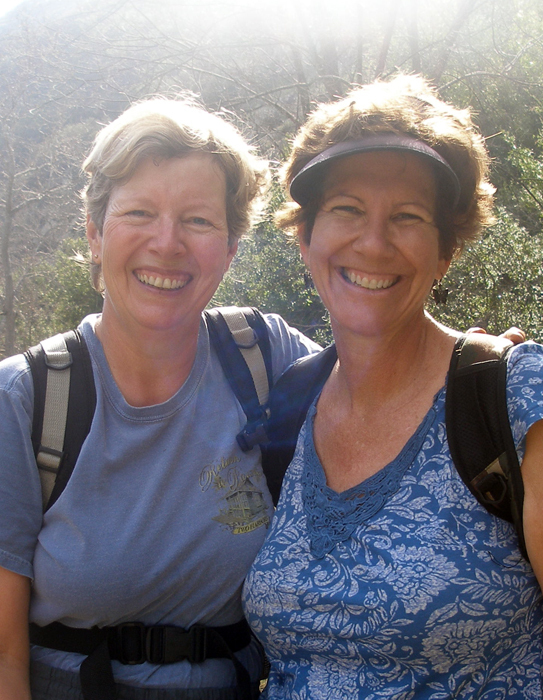 The three of us girls tramped through the Santa Monica Mountains today and reveled in our freedom and our maturity! Carol and Judy made a new memory today. The weather was gorgeous. I almost could believe that I was twenty again! Carol had scouted the area a week earlier. 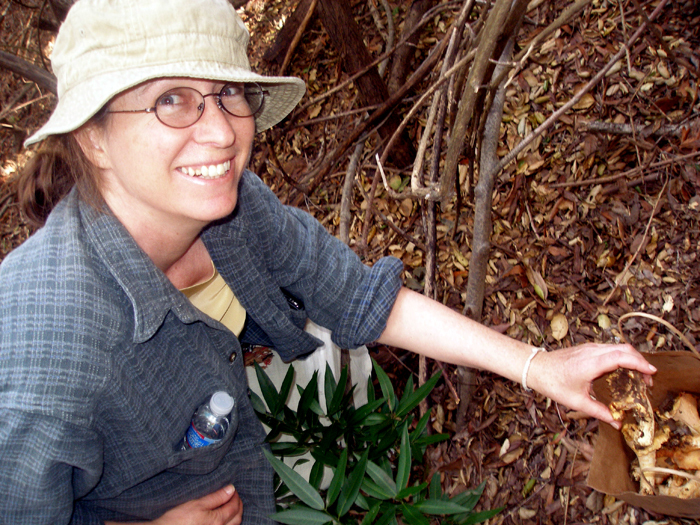 She knew where the moist riparian areas that might have chanterelles were. 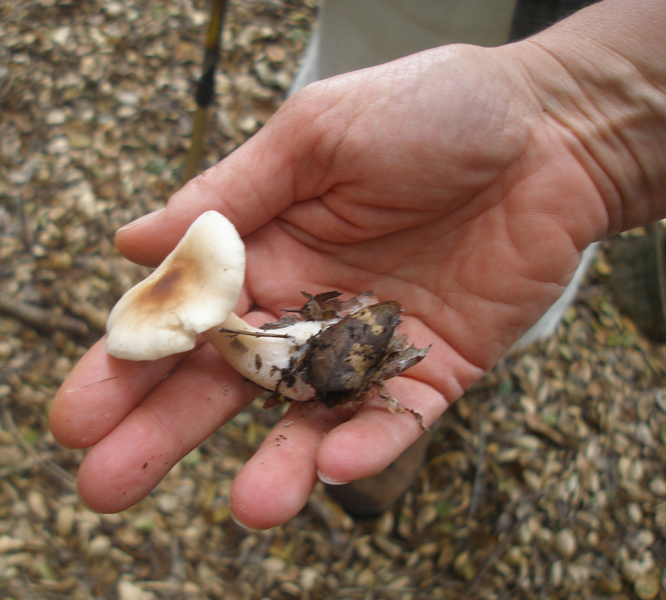 Finding the mushrooms after hiking for an hour was like discovering treasure. I almost slid down the steep hillside from the thrill! While Carol and Joni cleaned and prepared the mushrooms, I serenaded them with my guitar. 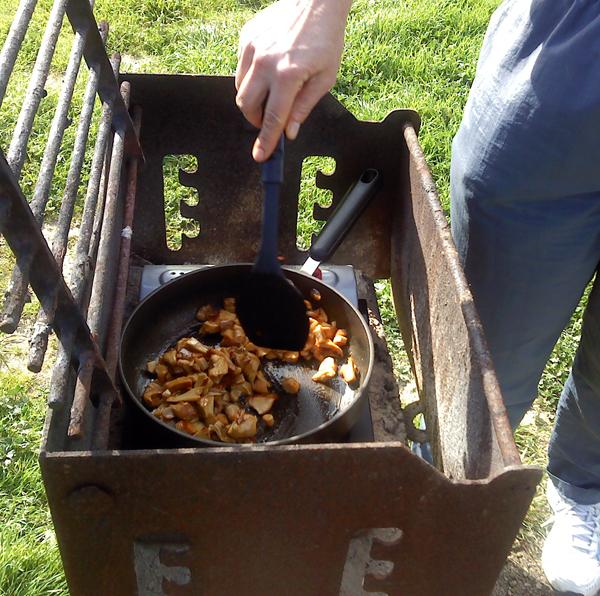 Carol was well prepared; she brought a camp stove and sautéed the mushrooms in butter, sea-salt and olive oil. All three of us moaned and groaned as we devoured our treasures. It was a beautiful day and reminded me of how much I love my life! It was really breezy and in order for the frying pan to get hot enough, Carol put it in this grilling area. I’m not going to eat this one! A reunion with three of my friends after thirty years. I have to see that I remain in awe of your coping skills and your ability to focus successfully of what needs to be done (for your mom and kids) and what you want to be done (creating). You are becoming quite a fully realized spirit. Sometimes, I wonder if God didn’t put you here to inspire the rest of us. My good friend has been grieving a terrible loss that happened less than two years ago. I let her know to be gentle with herself. I grieved for so many years! I’m glad if I could inspire other people! I told my friend that when I was grieving, my soul was “dried up” and I had no ability to access my creativity. I have a lot of appreciation for my creative abilities. I believe a lot of my joy now is because I have allowed myself permission to follow my passion! In regards to art, I do not desire to paint anymore. I find the computer a fascinating tool, and working with my artwork digitally has been very helpful for my “aging” eyes. In regards to music, I can only say that it has been an “IV of comfort to my soul.” I could not be more excited at this moment. 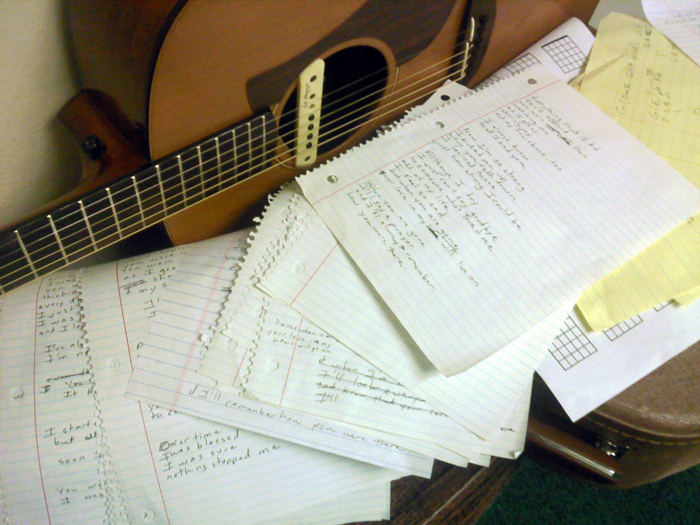 I will soon be recording two more songs to add to my repertoire. The anticipation of hearing my songs arranged has me dancing with joy! I called my arranger, George yesterday. 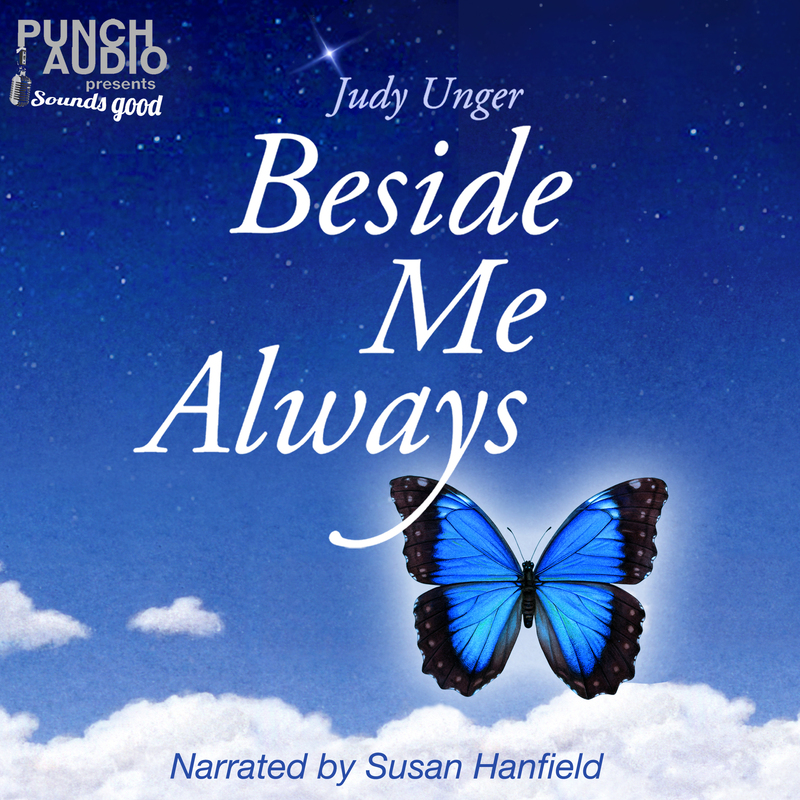 He said, “Hey Jude, I just had a feeling you’d be calling me – I could feel it!” He also told me he could certainly hear the excitement in my voice. A couple of months ago, I was running out of songs to record. At one of our last sessions, I choked on my tears that I would miss seeing George every week. Every penny spent on recording has given me more happiness than anything I have every done in my entire life. After many years of devoting myself to other people, I have invested in myself! My payoff is this: I could die tomorrow and I’d be happy because I know I’ve experienced unimaginable joy! I honestly mean that! Below is a picture of how my bathroom looks with all my drafts for my latest song. 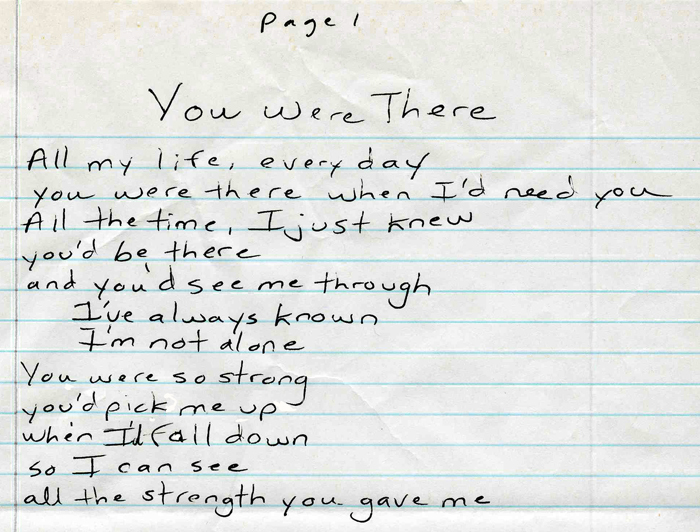 I scrawled at least fifty pages of lyrics and chords. I cry when I play my new song. It has invaded my heart and I can’t hear any other music at the moment. It needs more polishing, but my song truly explains to me why my journey began with my mother’s recovery last January. I will certainly share more about it soon. Writing is truly a mystery for me. Writing lyrics is hard work. Sometimes I cannot write, I just hum and sing. Then words suddenly are sung and the whole process fills me with amazement. For my blog, the desire to write can easily awaken me. I am compelled me to go to my computer, because I hear sentences speaking loudly in my head. That happened to me a lot earlier this year when I was writing about traumatic events in my life. Recently, I have written a lot of updates regarding my mother’s condition. When I am emotionally overwrought, writing becomes a great outlet. Like contractions, I expel the words and the stories – then I am spent and can rest for a while. Last week, I wasn’t able to rest. I guess I was overwhelmed with my mother’s situation. I wrote almost every day! I wrote my last post four days ago. I appreciated that my mind allowed me to rest. My mother has a strong spirit, but her aging body imprisons her. The demon of dementia raises it’s ugly presence to remind me how little control I have regarding my mother’s circumstances! She has been extremely confused the last two days. Her wonderful caregiver, Miriam, allows me a lot of respite from the situation. However, there has been a lot of risk for Miriam regarding my mother’s desire to walk. I am seeking another opinion regarding my mother’s hip fracture. My mother has been battling a respiratory ailment for over two months. I realize that is why I felt surgery was risky for her. The memory of when my mother was intubated and put on a respirator after surgery to repair her broken shoulder a little over a year ago is still very traumatic for me. An antidepressant was prescribed for my mother. It will be interesting to see if it is helpful for her or not. My greatest fear is seeing my mother suffer. I can share that. This entry was posted in Uncategorized and tagged "sandwich generation", Aging Parents, Caregiving, chanterelles, childhood friendship, composing, creativity, Daily Life, Friendship, GRIEF RELATED, guitar, lyric development, lyric writing, lyrics, mushroom hunting, Music, Ordinary Life, original songs, songwriting. Bookmark the permalink. I love the honesty expressed and the knowledge you have in regards to yourself and your mom. This new song feels so comfortable like it has been here before, I can hear it sung and look forward to hearing you record it. I also love the leap of faith you have in recording your songs without giving into financial pressure that life presents. Keep up the good work! Re: the hike in the mountains. It was another great day and I am sorry about the annoying cell calls I had to take; some very sensitive business issues that needed attention immediately. I did make my 3:15-3:30 appointment in the nick of time, of course I did look a bit funny w/ hiking boots and outdoor hat. Please, no apologies for the cell phone calls you had to make – I totally understand. It’s funny, but I was actually writing about the fact that I hated all of MY cell phone calls! Because of my mom’s situation, plus the lawyer for due process.- I had so many calls coming through and couldn’t turn off my phone (though I did later on). Oy! Still, my kids didn’t need me – so that’s an improvement! I wish we could be outdoors and totally away from it all – but I guess that’s not happening right now. Glad you made it to your appointment on time! Your boots and hat were adorable and I love our pictures. 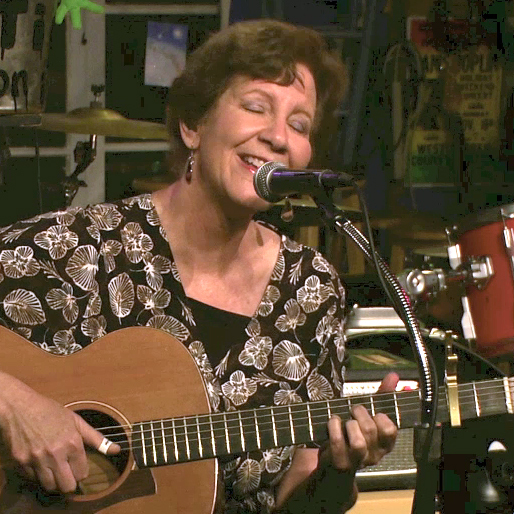 Thanks for your encouragement with my songwriting – glad I could share my new song with you. It certainly does feel like I’ve heard it before, so I hope I didn’t rip off another song in my subconscious. I love you and appreciate our friendship so much!